Penguin Series A-A in-tank filter systems mount the pump and filter chamber together inside or outside the tank. With no metal to contact the solution, these A-A in-tank filter systems are ideal for precious metals and are proven to operate with no possible solution loss. Choose from eight different styles and configurations. Click on the model number or to find out the model needed, use the selector menu to choose the motor phase, flow rate, and the type of pump and chamber combination. Or call or chat for free guidance! Penguin Series C filter chambers feature a unique cartridge compressor design that accepts a wide cartridge length variance without liquid bypass while eliminating the center rod, springs and tubes. Choose from more than 30 styles and configurations to accommodate a huge range of requirements such as pressure, temperature, cost and more. Click on the model number or to find out the model needed or use the selector menu to choose from CPVC, polypropylene or PVDF, number of chambers and their diameter and flow rate, and the inlet/outlet connections. Or call or chat for free guidance! Penguin Series A-B in-tank filter systems mount the pump and filter chamber together entirely inside the tank. 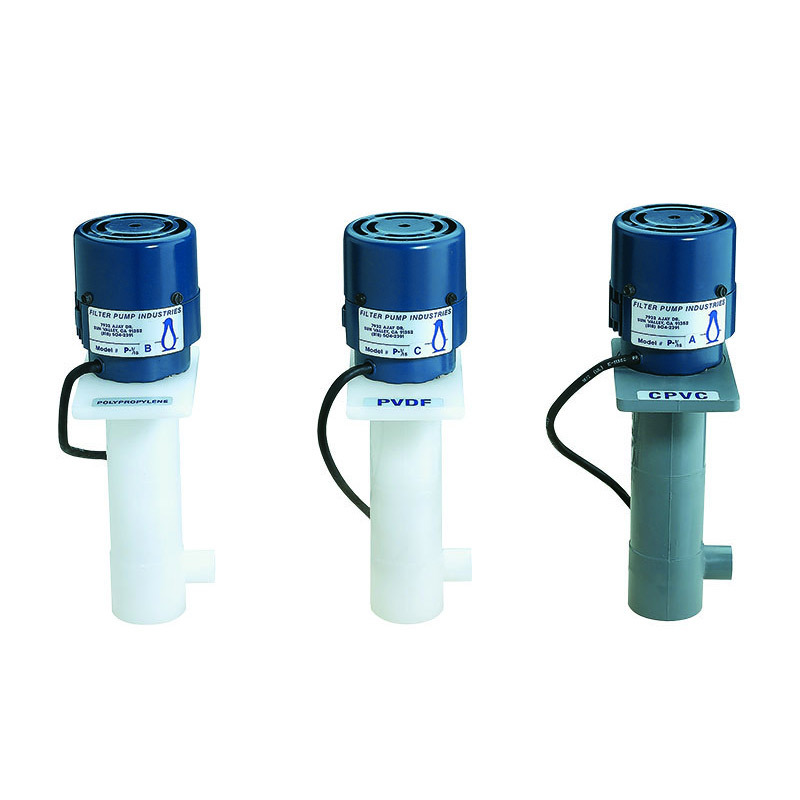 With no metal to contact the solution, these A-B in-tank filter systems are ideal for precious metal filtration and are proven to filter with no possible solution loss. Choose from nearly 20 different styles and configurations with flow rates ranging from 100 - 2,150 gph. Click on the model number or to find out the model needed, use the selector menu to choose the motor phase, flow rate, and the type of pump-motor-chamber combination. Or call or chat for free guidance! Penguin Series CN in-tank filter chambers eliminate the potential for solution loss. Choose from 16 different styles and configurations to accommodate a huge range of requirements such as pressure, temperature, cost and more. Click on the model number or to find out the model needed or use the selector menu to choose from CPVC, polypropylene or PVDF, number of chambers and their diameter and flow rate, and the inlet/outlet connections. Or call or chat for free guidance! Penguin Series CB filter bag chambers deliver high volume surface filtration down to one micron. Choose from four different sizes to accommodate a wide range of requirements such as pressure, temperature, cost and more. Featuring an all-CPVC design, just click on the model number or to find out the model needed or use the selector menu to choose the filter bag size and flow rate, and the inlet/outlet connections. Or call or chat for free guidance! Penguin Series CT carbon treatment chambers come in more than 20 styles and configurations to accommodate a wide range of requirements such as pressure, temperature, carbon capacity, cost and more. Click on the model number or to find out the model needed use the selector menu to choose from CPVC, polypropylene or PVDF, the number and type of carbon bags and flow rate, and the inlet/outlet connections. Or call or chat for free guidance! Penguin HSC Series 316 stainless steel centrifugal pumps provide superior corrosion resistance for a wide variety of OEM and chemical processing applications. These stainless steel pumps offer high operational efficiency and low maintenance, and are available in single or double mechanical seal with water flush. HSC-1/4-2 series pumps are single stage while the HSC-3 is two stage. Choose from more than 40 models with max flow to 132 GPM with a max head of 85 ft. and 2 in. suction / 1.5 inch discharge. Click on the model number needed or to find out the model needed, use the selector menu below. Choose the motor phase, the max head and max flow, then type of seal. Select Viton seal for high performance in corrosive and high temperature applications. Call or chat for free guidance! Call or chat for free guidance!